With WilFiks, Gardening Pruning Saws are an essential tool in your tool kit for perfect results every time. Your garden will be the talk of the town with these pruning hand saw that deliver sharp, smooth cuts for clean results that quickly slices through branches and bushes for faster, prettier and above all healthier landscaping. These All Purpose Multi-Use Foldable Hand Saw is perfect to use for Gardening, Pruning, Trimming, Sawing, Camping, Hiking, Hunting & Cutting Wood, Drywall, Bone, & More. It's the perfect edition to your tool box. YOU'LL NEVER NEED ANOTHER SET OF GARDENING SAWS. 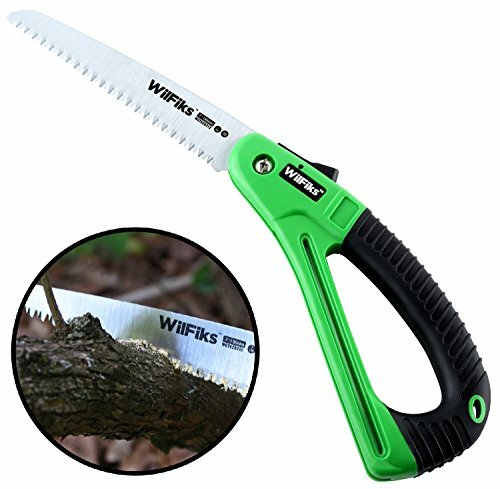 Strengthen your trees, saplings and shrubs with WilFiks Gardening Saws, which are specially designed with hardened steel that deliver smooth, sharp and precise cuts every time for clean and professional results. The hardened steel is also very easy to sharpen and since the saws are so durable they won't become ruined during maintenance. TEND TO YOUR GARDEN COMFORTABLE WITH THESE SPECIALLY DESIGNED SAWS. The ergonomic design of these gardening saws make them incredibly easy to clean. They are designed to work well with large or small hands and prevent discomfort, aches, pains and blisters. If you know someone who loves to garden or works with garden maintenance, these gardening pruning saws are a thoughtful gift that they will love. At WilFiks we are committed to producing top quality products that we know you will love. If for any reason you aren't completely satisfied with your purchase, please contact us so that we can be of assistance. ► PRUNE, CUT & TRIM: With these Rugged 7" Compact Razor Tooth Hand Saw, cutting your shrubs, bushes, branches and trees is easy thanks to razor sharp hardened carbon steel blades and comfortable grip. Ideal and convenient for small-large sized hands, And for two handed cutting. ► DURABLE CONSTRUCTION AND QUICK CUTS: Three cutting surfaces to cut up to 50% faster than traditional handsaws. Our hand saw fast cuts on push and pull strokes. Hardened steel blade produces smooth and sharp cuts that quickly slice through branches & twigs for faster, prettier and healthier landscaping. ► ERGONOMIC AND SAFE HAND PROTECTION DESIGN: D-Shaped Style with Non-Slip Soft Rubber Handles designed for maximum comfort and sturdy feel while Cutting/Sawing, these saw makes gardening comfortable so you can enjoy your hobby for hours on end without blisters or calluses. Blade locks in folded and unfolded positions for safety. ► FOLDABLE COMPACT DESIGN: The Hand Saw storages easy and safe, it folds down to 8.5" and only 2" wide, Convenient Hanging Hole for Easy Storage. The blades and rubberized grips are super easy to clean and require virtually no maintenance. ► EASY TO USE: The Saw is perfect to use while Gardening, Pruning, Camping, Fishing, Hunting, and More. Ideal and convenient saw for cutting through large tree branches. You can count on these hand saws to deliver superior, long lasting performance and great results.